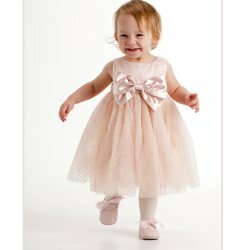 What a unique dress for one very unique little girl! 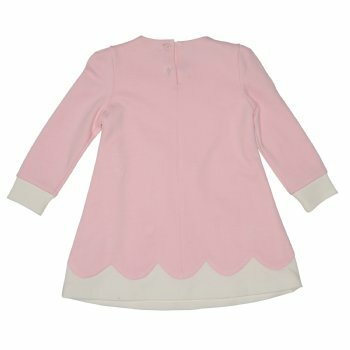 This Biscotti "Artistic Flair" pink dress is chock full of adorable cuteness. 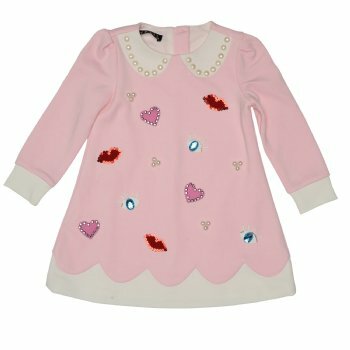 Playful appliqués of hearts, lips and eyes are embellished with sequins, sparkling stones and faux pearls that make this dress a real standout! The faux Peter Pan collar in contrasting ivory, embellished with pearls, and the scalloped hemline adds even more whimsy to this dress. The 18 mos. and 24 mos. sizes have 3 buttons in the back. Toddler sizes have a zipper. A great Big Sister/Little Sister combination that they will both love to wear.